May 6, 2014 May 6, 2014 Nefer Khepri, Ph. 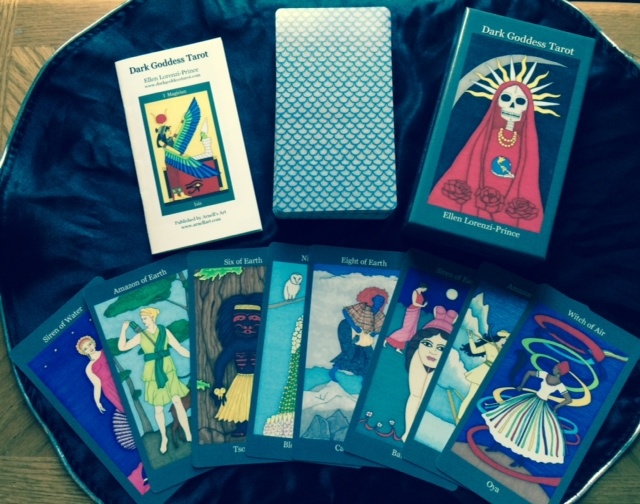 D.
The Dark Goddess Tarot is a 78-card journey through the various manifestations of the Goddess or important female mythic characters. These images make excellent focal points for meditation or ritual, in addition to being a tool for divination. The Dark Goddess Tarot comes in a gray box that is just slightly larger than the cards, thus housing the cards securely. Contained within the 6 x 3 3/8” box is also a LWB (Little White Book). The box is illustrated with the image from the Death card, Santa Muerte on the lid. Six miniature depictions, each of a different card, grace the sides of the box. A seventh card, Spider Woman as the Star card illustrates the base of the box. I prefer tarot boxes that illustrate some of the cards because it gives the consumer a good idea as to the general style and overall look of a deck. “The Black Madonna. European Mother of Miracles. Compassion and devotion make the impossible possible” (LWB, p. 7). A second example: 6 of Water ~ Tefnut. Egyptian Goddess of Dew and Rain. Renewal starts with simple pleasures (LWB, p. 14). Should you be called to this deck and you are a beginner I recommend a good book on how to read tarot cards, for example, Leo Louis Martello’s Reading the Tarot. There is now also a 6X9” guidebook for this deck is now available at the web site. Formats are: PDF, EPub, or Mobi file. If you have a Kindle like I do, then you’d want to ask for the Mobi version. My Kindle version (Mobi format) uploaded to my Kindle just fine & I could immediately view it. The Kindle version has lovely full color illustrations of each card. If you double-tap on the image you can expand it to nearly full-screen in order to see finer details. • The high points of that particular goddess’s story. 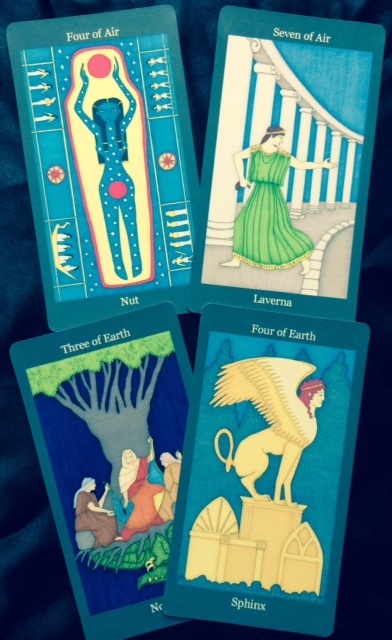 The focus is on particular aspects of each goddess as they relate to the meaning of the card. The book itself begins with a section explaining how to work with goddess energy and this deck can easily be used to connect more closely with the energies of particular goddesses. At times the prose waxes poetic and this is truly one of the most beautifully written guidebooks I have ever read. It is clear that it was written with great love for all aspects of the Goddess. The guidebook is a real pleasure to read, plus it contains a great deal more information so I would really recommend you also obtain a copy. 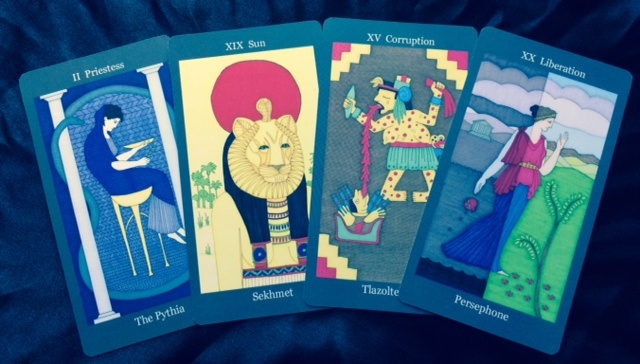 The imagery of t he cards is all goddess oriented. There is a goddess or female mythic figure depicted on every card. Suits are Water (Cups), Air (Swords), Fire (Wands) and Earth (Pentacles). The court cards are: Amazon, Siren, Witch, and Hag. All the minors are fully illustrated. s the Three Norns and the 4 of Earth has four mountain peaks in the background. The energies of each goddess depicted are well suited to its corresponding major arcana card. It is clear that a tremendous amount of research went into the creation of this deck. Ellen Lorenzi-Prince demonstrates a thorough understanding of the Goddess and her mythos in various cultures across the planet and in various time periods. The deck pulsates with an energy all its own. If you’d like to get to know the Goddess better, this is definitely the deck for you. Egyptian Lenormand (only 11 copies remain then when it’s gone, it’s gone until the Schiffer edition is published that will have different images for a number of cards). Previous The Doppelganger – Do You Have One Roaming Around Somewhere? Next Deck Review: The Outback Lenormand.